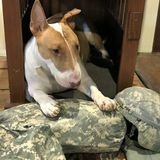 Charlie is 6 year old English Bull Terrier. One-on-one he is fine. With other dogs he can be a handful so important for him to be away from other four-legged friends. Charlie and I live in the woods of Killingworth but due to a job opportunity I will be getting a studio apartment in Stamford (M-F). On the weekends we will return to our place up north. At this time I am in the preparation stage and want to line everything up for a possible move in May. As a sitter/dog walker you should feel comfortable handling an 80lb. Bully. This would be a 5 day commitment. I would be leaving the apartment around 6:30 am and return about 7:00 pm so a mid-day walk would be needed (12:30 or 1:00 pm). Check on water and maybe a treat but feeding not necessary. Once we are set up in the apartment (probably close to the train station) Charlie and i will be available for a visit . Looking for Hardworking Pet Care Sitter in Stamford.